We all know the kitchen is the heart of the home. Give yours an awesome and eye-catching update with new kitchen kitsch designs! 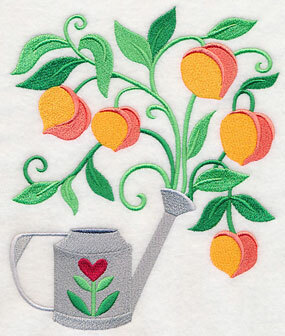 Pick a favorite fruit or veggie to feature blooming out of a watering can on kitchen towels and aprons. 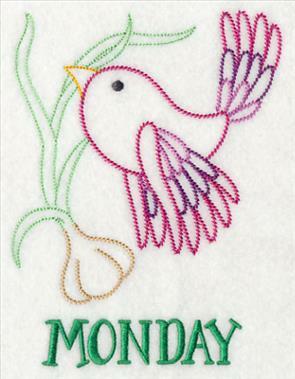 You'll also find new days of the week birds and veggies for tea towels, tasty tomato designs, and sweet kitchen laurels. 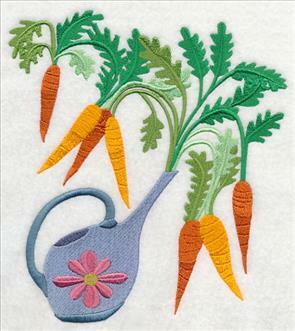 They're a fun and fabulous way to brighten up reusable grocery bags, placemats, and so much more! 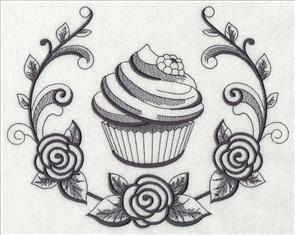 Scroll down the page to find the tasty designs and order today! 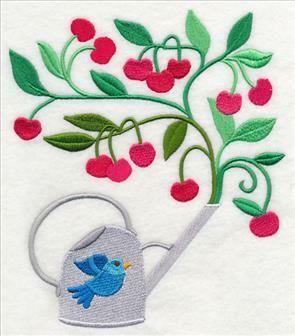 Crafty and creative bunting adds style to this kitchen towel; embroidery brings bold flavor. Find the tutorial right here! 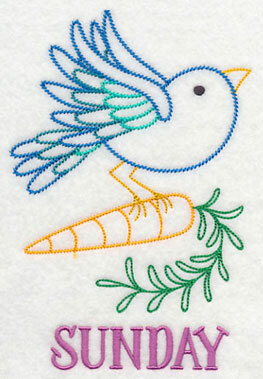 Bright, colorful birds carry tasty veggies in these days of the week designs. Stitch on tea towels for a complete set! 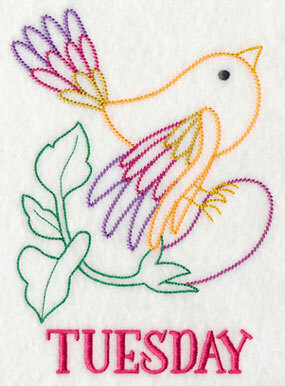 4.87" x 6.61" and 2.76" x 3.74"
Tuesday's bird carries a purple eggplant, while Wednesday features a bright green pepper. 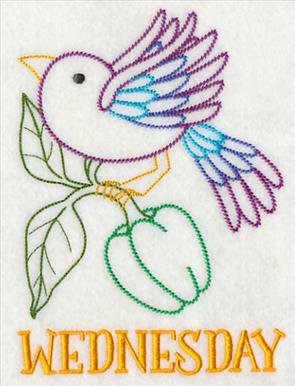 Each of the days of the week are featured on the last color stop for these designs, making them easy to stitch the birds and veggies on their own. 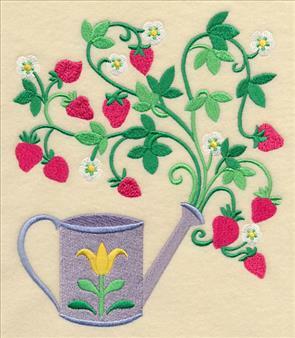 4.86" x 6.77" and 2.75" x 3.82"
The light vintage style used in these colorful motifs make them delightfully quick-stitching designs. Use on light, low-nap fabrics such as twill, linen, tea towels, and canvas for best results. 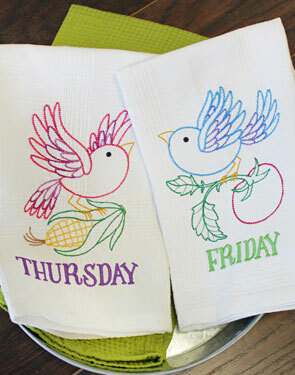 4.86" x 6.61" and 2.75" x 3.72"
Brighten up your home with these days of the week designs. 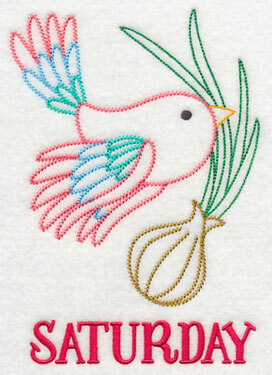 They're a delightful addition to any kitchen embroidery project. 4.86" x 6.86" and 2.75" x 3.86"
Get all 7 of the sweet days of the week tweets and veggies in a pack. 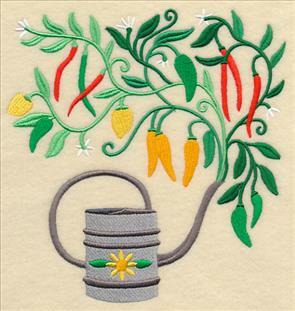 Plant delicious fruits and vegetables on your next embroidery project with these bountiful watering cans! Each design features a colorful and eye-catching can bursting with fresh flavors like the tomatoes and strawberries below. 6.77" x 7.81" and 5.86" x 6.75"
6.75" x 7.81" and 5.86" x 6.78"
4.78" x 5.53" and 3.33" x 3.85"
Flowers, birds, and other spring scenes adorn the watering cans, while ripe, juicy fruits and vegetables sprout from their spouts. 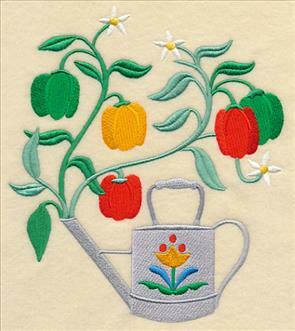 Brilliant on kitchen decor, such as aprons, kitchen towels, placemats, wall hangings, and more. 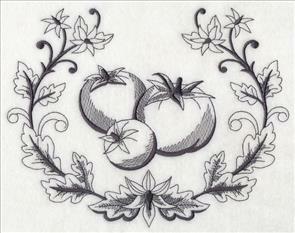 6.80" x 7.81" and 5.84" x 6.71"
4.85" x 5.56" and 3.36" x 3.86"
Adorn a wine bag with the grapes featured on the left, or update the wrap of a jar of peach preserves with the design on the right. 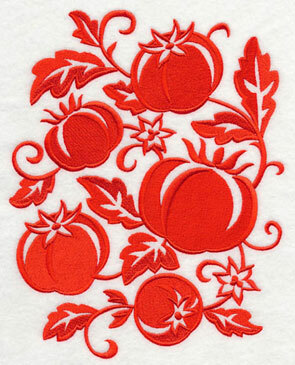 These fresh motifs are fabulous on a wide variety of projects! 6.72" x 7.77" and 5.86" x 6.81"
6.61" x 7.80" and 5.86" x 6.92"
4.86" x 5.74" and 3.29" x 3.89"
Not only do these delicious designs shine on kitchen decor, but they're fabulous for gardening gear, reusable grocery bags, and spring projects as well. 6.83" x 7.81" and 5.86" x 6.70"
4.83" x 5.43" and 3.45" x 3.89"
Chili peppers and husks of corn finish off this collection of homegrown watering cans. 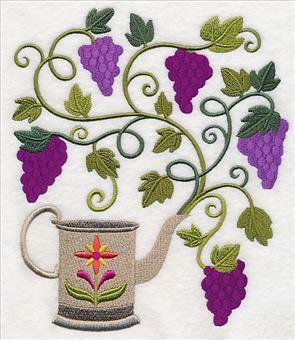 A delightful addition to wall hangings, framed art, pillows, and more! 6.91" x 7.26" and 5.86" x 6.16"
6.90" x 7.76" and 5.85" x 6.58"
4.85" x 5.46" and 3.47" x 3.89"
Purchase these brilliant blooming watering cans individually by clicking the links above, or get all 10 of the designs in a pack. 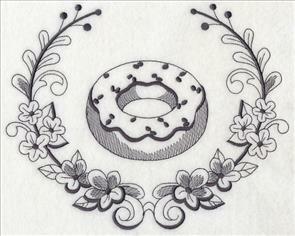 Sweet treats encircled in a wreath of sugar flowers are a tasty addition to any kitchen project. 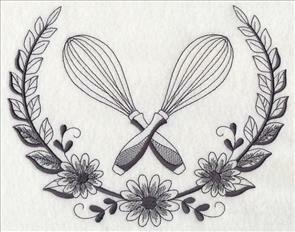 Stitch the desserts as framed art, on a wall hanging, or an apron for a delicious look. 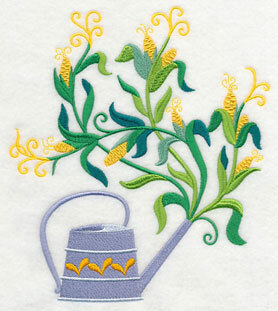 Get creative with your embroidery! 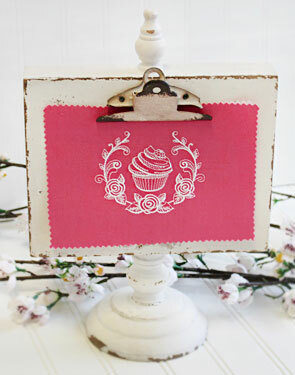 Here we've stitched the yummy cupcake laurel with white thread on a swath of pink fabric and used a decorative clipboard to turn it into a sweet kitchen decoration. 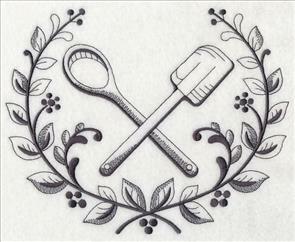 Crossed cooking utensils are a unique way to create your own cooking crest on tea towels or placemats. 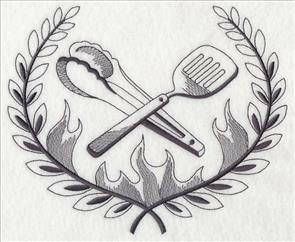 Pick several kitchen laurels to stitch together, or pick your favorite to use alone. A pair of crossed whisks and a trio of plump, juicy tomatoes finish off the selection of elegant and sophisticated laurel designs. 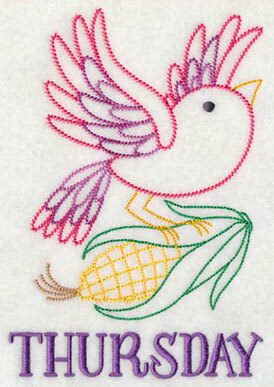 And don't forget -- because these designs use just one color, they're surprisingly quick-to-stitch, too! 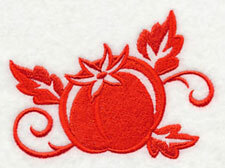 Bring fresh and fabulous flair to your embroidery projects with beautiful one-color tomato designs. 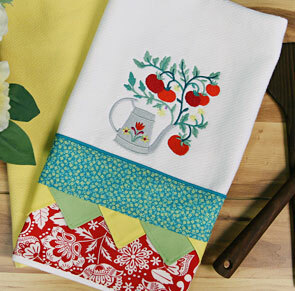 Towels, table linens, aprons, pillows, and more get a tasty update with these quick-stitching designs. 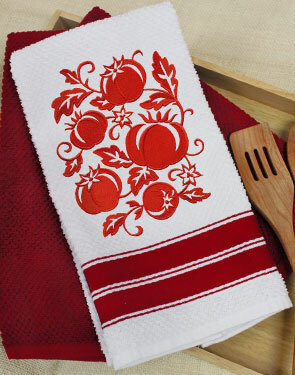 6.91" x 8.70" and 6.21" x 7.81"
5.51" x 6.93" and 4.85" x 6.10"
A dish towel with a bright red stripe brings out the bold, graphic style of this design. 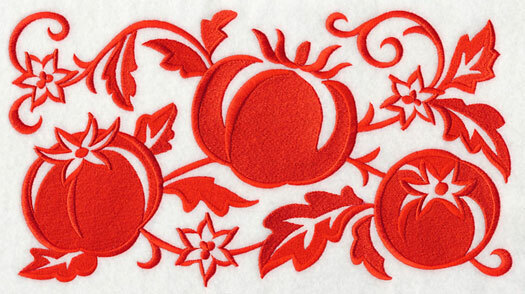 Add bold style to quilts and wall hangings with these juicy tomatoes. 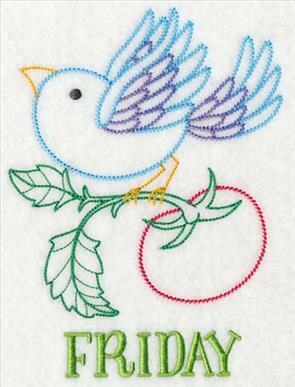 The open spaces in these designs make them perfect for stitching on solid, sturdy fabrics. 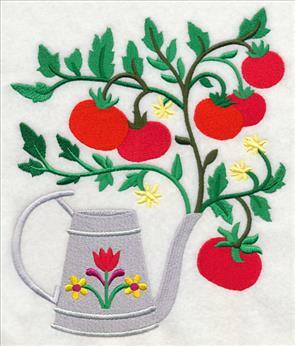 11.75" x 6.49" and 9.41" x 5.20" and 7.81" x 4.31" and 6.00" x 3.46"
A thin border featuring the robust tomatoes is perfect for running along tablecloths, placemats, and aprons. 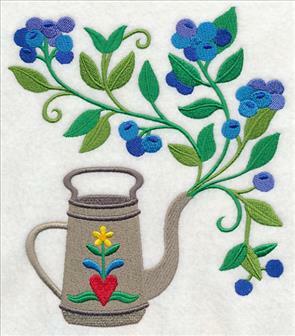 The 5" x 7" size of the border has been formatted for both Endless Hoop and standard hoops, or reference our tutorial and video on repeating border designs. 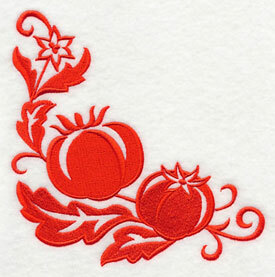 11.75" x 3.55" and 9.41" x 2.85" and 7.81" x 2.36" and 6.00" x 2.10"
Add just the right serving of bright tomatoes to pillow shams, napkins, pockets, and more with a corner and accent design. 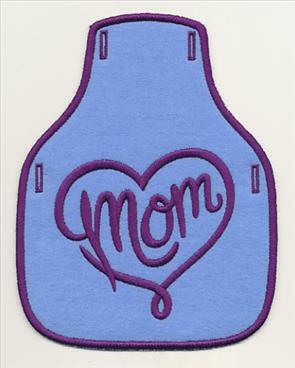 Wish Mom a Happy Mother's Day with these sweet and thoughtful bottle aprons. 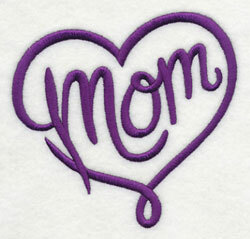 Kara requested the designs as a cute and crafty way to celebrate her mom, and we loved the idea. Here the apron has been designed to look like, well, an apron! 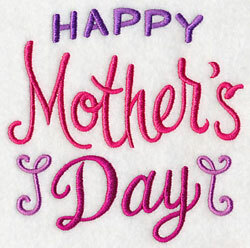 Great for hostess gifts, housewarmings, and other occasions as well as Mother's Day. 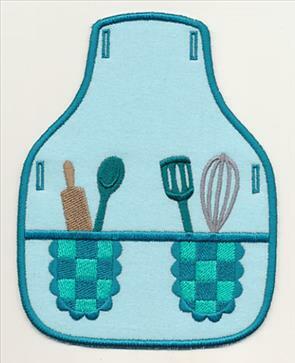 Add these bottle aprons to bottles of wine, lotion, hand soap, olive oil, and more! 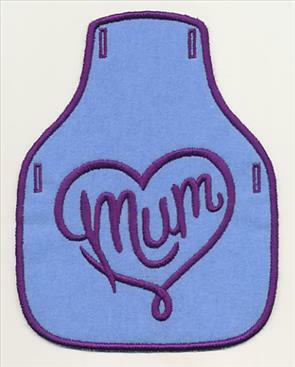 The following Mother's Day bottle aprons also feature a separation to add to coordinating tea towels, aprons, or other gift ideas. 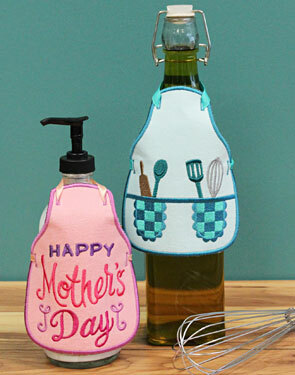 Find the helpful tutorial on bottle aprons here, and the video tutorial here. 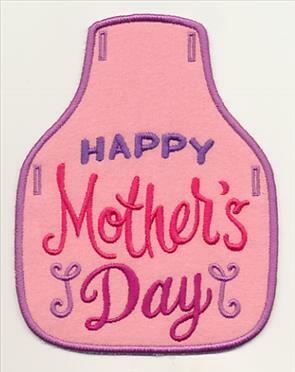 4.86" x 4.87" and 3.86" x 3.87"
Not only does this "Mom" bottle apron and matching separation shine on fabulous Mother's Day gifts, but they're also terrific for wishing her a Happy Birthday, or simply celebrating her for everything she does. 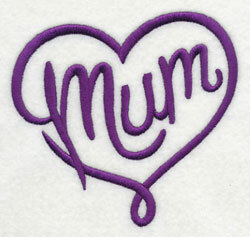 5.12" x 4.86" and 3.86" x 3.67"
A variation of the above design featuring "Mum" instead of "Mom" has been created, too! 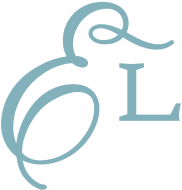 Get helpful step-by-step instructions on bottle aprons here, and a fabulous video here. 5.13" x 4.87" and 3.87" x 3.68"